I love how he’s drawn in the first panel. Very well done. Also, does self-inflicted pain count? He could get his friend to stop by biting his own tongue. Biting your own tongue might not be recommended for someone with canine teeth. Incisors are much less likely to punch a hole and cause major bleeding. Still he could punch himself in the face, but that might draw funny looks from the other bar goers. Or he could just do nothing and… well, I guess that’d be a bit too icky. Grakarr <3 Adar == twu wuv! Their hearts are already bound with the Silver Chain. They just need to drop the pretenses already. Heh BEER IN FACE! Or ale, or whatever it is… Honey mead…. 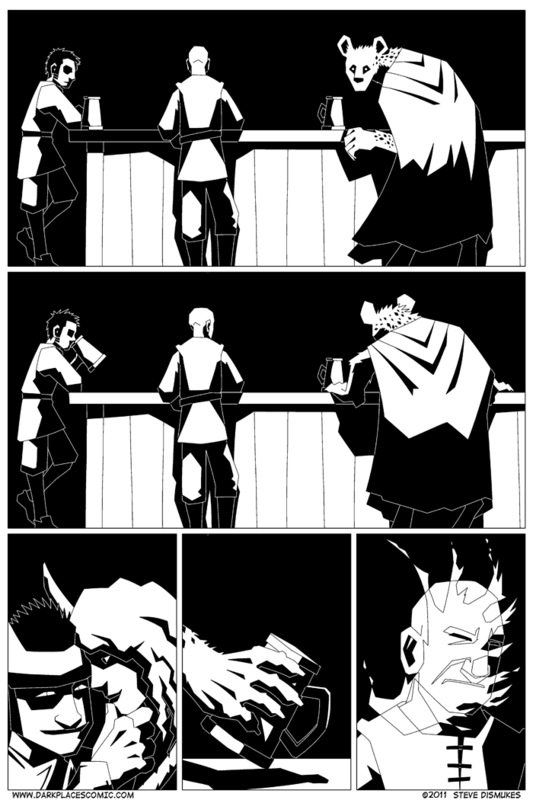 I really like the first and last panels on this page. There’s just something about the ambience and the splashed man’s face… It’s wonderful! And does it count as self-inflicted pain if you started the fight and the other guy punches you? Actually, if gnolls are anything like hyenas, Grakarr could indeed be female. Female hyenas are … unusually … masculine. Look it up.